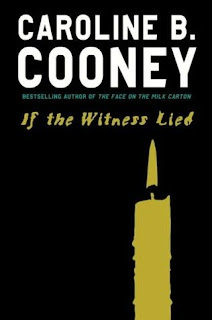 It's been years since I read any of Cooney's popular titles but I picked up this title as my husband and I browsed for books for Teenage Boy to take on vacation. I've griped about this before but he does not like to GO TO the LIBRARY anymore...!? I hope his senses will return to him one day but as I expect him to read-we get him the books, he picks out a few that he "deems" somewhat interesting and he reads them. He read this one over vacation and when I asked him how it was he looked at me and shrugged very nonchalantly (if you have teenagers you know what I mean) and said it was okay in a very flat line voice. So I had to pick it up and read it just to see what that meant. The story was predictable.The characters were flat. The candle on the cover doesn't fit-Jack Fountain on a bike, a television camera, a little boy in a Jeep-any of these would have worked. It never fully adds up and Cooney doesn't give me a good reason for Aunt Cheryl. It was kind of sad to think no one cared about these kids to look deeper into their tragedy! Come on neighbors down the street! Can you feel my shoulders shrug? Read The Compulsive Reader's post if you want a different perspective. Benjamin at Teen Reads talks about it . My husband tells me that I never read books I don't like because all my reviews are positive so this one's for you, honey.